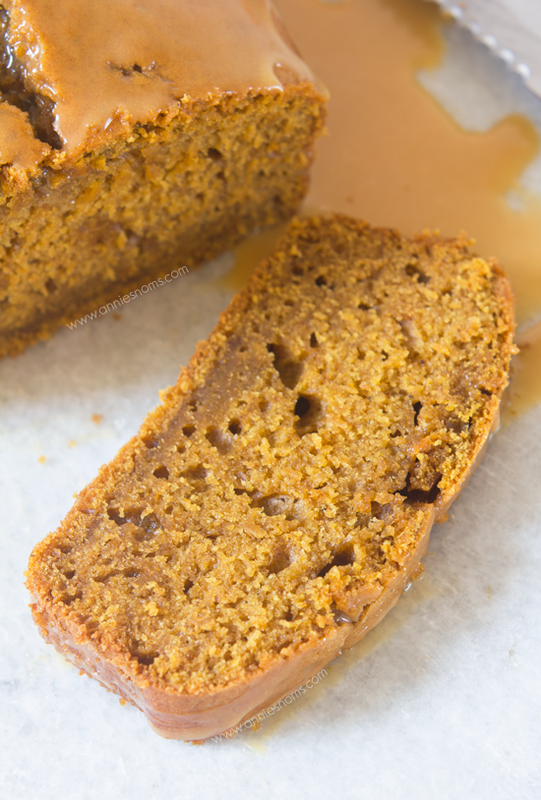 This Pumpkin Bread with Salted Caramel Glaze is sure to become a family favourite! Soft, tender and almost fudgy, the lightly spiced bread is perfectly complimented by the salty, sweet glaze. Hello friends! 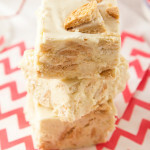 Today’s recipe is one you definitely don’t want to miss! 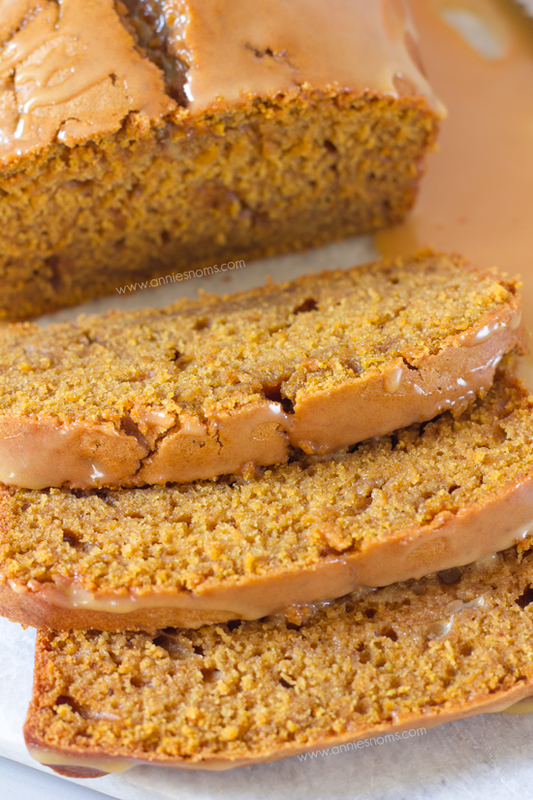 It’s my version of the perfect Pumpkin Bread. Made even more delectable with a salted caramel glaze. Soft, spicy, sweet, salty; this bread has it all going on! 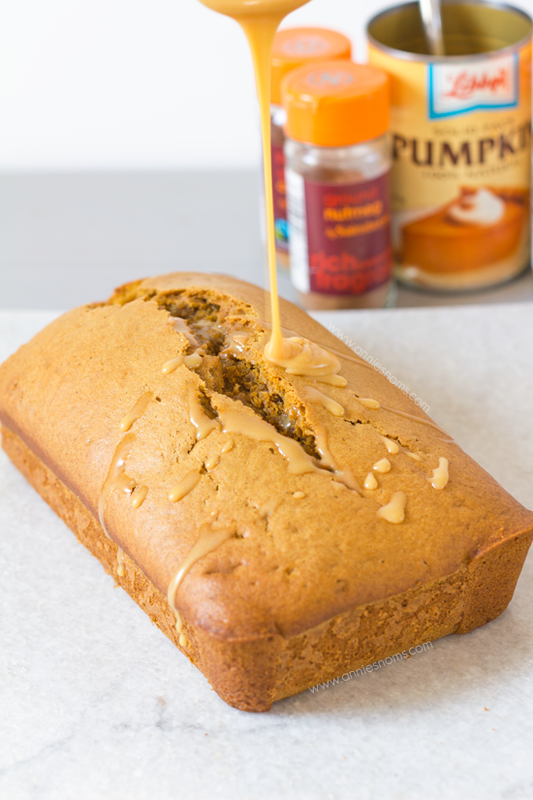 I can’t even believe this is only the first pumpkin bread I’ve made this year. When I bit into a hearty slice of this, I wondered why I don’t make it every week, it’s just amazing. AND, it also marks the first recipe of my “Back to Basics” week. Remember that little blogging series I started last year? I mean, my perfect vanilla cupcakes are still the most popular recipe on my site and it’s been over a year! 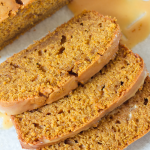 I firmly believe that everyone needs a good Pumpkin Bread recipe in their lives. 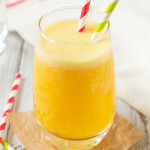 So, I’m adding to the elevently billion recipes already online and showing you how I do things! How about a maple glaze? Or chocolate? Both, would transform this from a plain bread, to a fancy, shmancy bread! The best thing about this glaze is that some of it is absorbed into the top of the bread, so you get the sticky glaze on top, but in the bread you also get salty notes. Heaven. I didn’t even like salted caramel until recently, what the heck was wrong with me?! Now, I’m addicted! 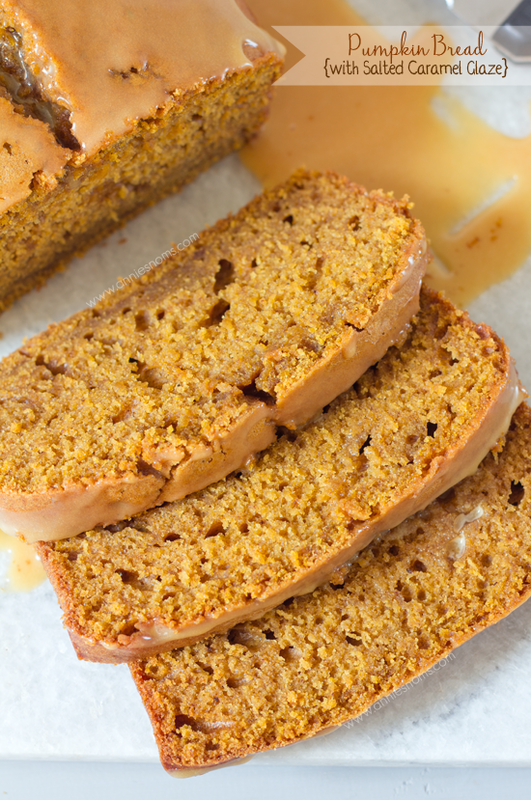 There’s a whole cup of pumpkin in this recipe and no butter in sight. I used a mixture of vegetable oil and milk, to give this bread its fudgy, soft texture. I’ve had experience in the past with oil in recipes making things either so dense they are a solid lump, or greasy. So, in developing this recipe, I made sure there was enough to make it moist, (I know, I hate that word too!) but still keep its bread consistency. Milk adds structure, due to its proteins AND moisture, whilst the oil adds moisture. Milk is a clever old thing… Not just for drinking! I also used a mixture of white and light muscovado sugars in my recipe. If I’d have used all muscovado, the caramel flavours may have been overpowering, considering there’s also a caramel glaze. And it could have turned out too dense and pudding like. However, all caster sugar may have made this too light and cake like – I did want that dense, fudgy texture, so a mixture of both was definitely the way to go! 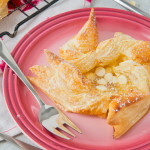 Flour wise: there’s 2 and 1/4 cups of plain flour – I was going to experiment with bread flour as I adore how it transforms my cookies, but, I decided against that. The oil, milk and brown sugar ensure this is tender and soft, without being too like a yeasted bread or too spongy! I baked the bread at 160C/325F for around 75 minutes. In the past, I’ve made quick breads at 180C and they tend to dry out on the outer edges and not be cooked in the middle, so I have to turn them down after 50 mins anyway. I find that with big, dense loaf cakes, lower and slower is much better; you end up with a softer bread and no overly browned bits! 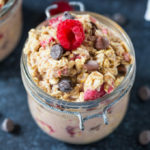 In terms of how you can change this up: chocolate chips, extra spice, cinnamon chips, maple syrup… the list is endless. Go wild! This bread is super versatile, which is exactly why I absolutely had to share it with you as part of my Back to Basics series! I sent this to work with my OH and got an empty container back with just a few crumbs. Preheat the oven to 160C/325F and grease and line a 2lb loaf tin. Place the flour, baking powder, bicarb, salt and spices into a medium sized bowl and stir until combined. Leave to one side. Place the sugars, oil and eggs into a large bowl, or the bowl of your stand mixer and mix on medium speed until smooth and well combined. Add in the pumpkin and flour mix and mix on medium speed until smooth and combined, about 1 minute. Add in the milk and mix on low until combined. Transfer to your greased pan and place in the oven for 65-75 minutes, until risen, golden and an inserted skewer into the centre comes out clean. Leave to cool in the pan completely, then transfer to a plate or container in order to add the glaze. To make the glaze: place both ingredients into a small bowl and whisk until well combined and smooth. Drizzle half the glaze over the bread, wait for it to set a little and absorb into the bread and then drizzle the remaining glaze over the bread. 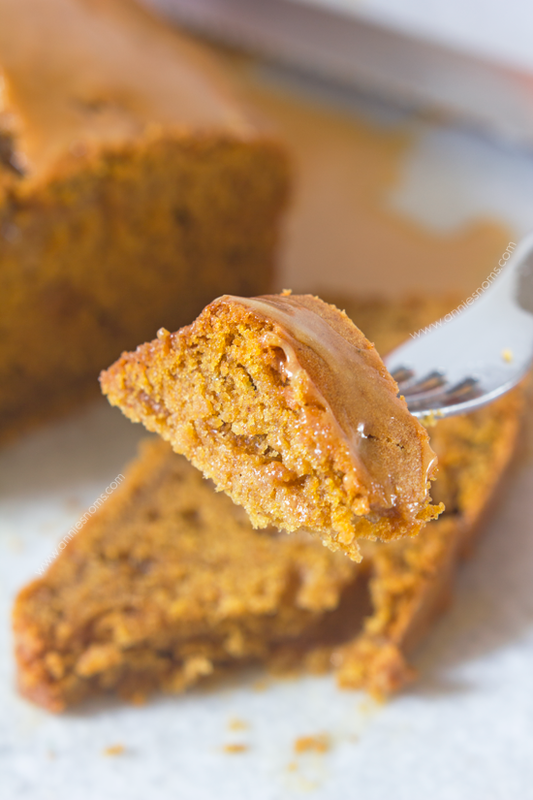 Pumpkin bread will keep in an airtight container, at room temperature, for 4-5 days. Bread tastes better on the 2nd day! Oh my heavens! I saw this at the link party and had to come check it out. Look at that moist deliciousness! You really can’t go wrong with pumpkin and salted caramel. I can’t wait to try it! These look DELICIOUS. Want. Pinning to my recipe board. I’m so upset I have no groceries right now, haha! Oh my gosh, unbelievably yum! 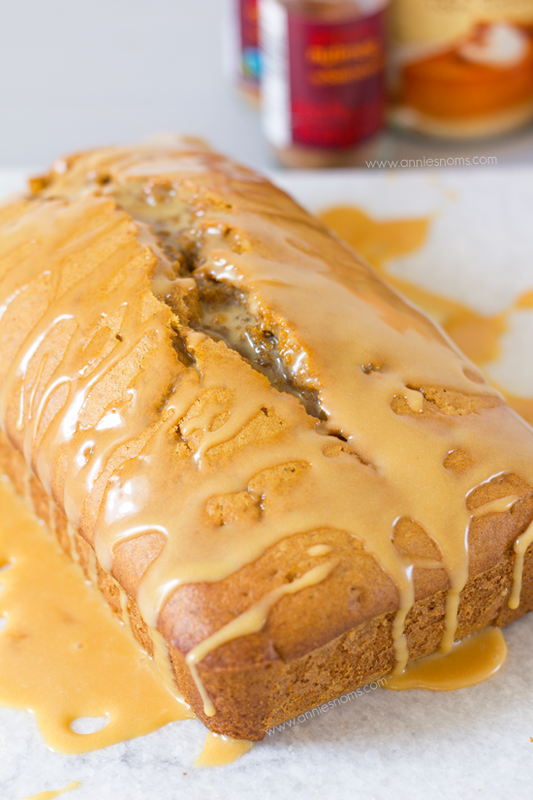 I recently embarked on an obsession with salted caramel so I am all over this! This is a wonderful delicious looking cake!! 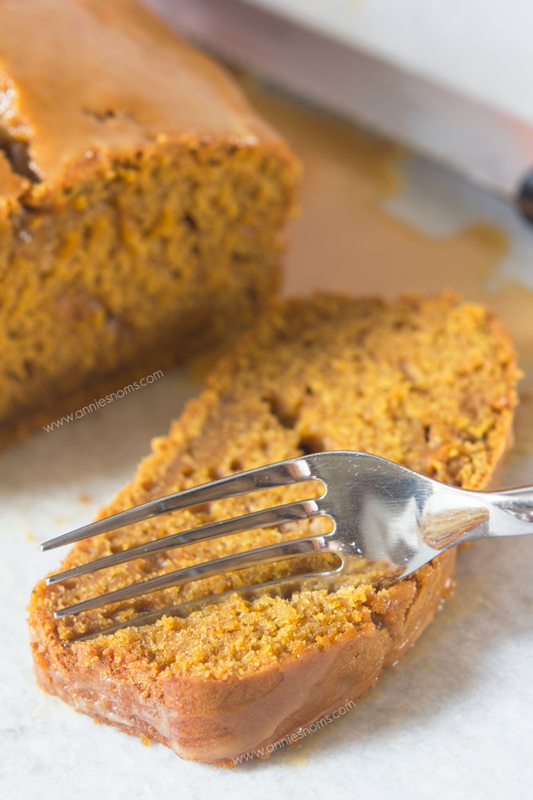 I just love the wonderful glaze for this delicious pumpkin bread. Hope you are having a great day and thanks so much for sharing your awesome post with Full Plate Thursday. That is some serious deliciousness here! Pinning!